If you are looking for an all-in-one probiotic supplement to buy online, then Now Foods Probiotics 10 Billion may have caught your attention. Supporting gastrointestinal bacterial balance may be a contributing factor to overall wealth-being and good immune function. Digestion is a complicated process, converting carbohydrates into energy while also ridding our system of toxins and wastes. This process would not be accomplished without the trillions of probiotic microorganisms living within the gastrointestinal tract. NOW Foods sought to develop a multi-pronged product to support good digestive health which could help restore, repair and maintain a healthy balance of the gut flora. The end result is their Probiotics 10 product line. 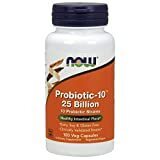 Many manufacturers of probiotic supplements have developed formulas imitating NOW Foods Probiotic 10 product, but the NOW Foods formula still remains the golden standard for this multi-strained offering. The average adult has about 3.5 pounds of bacterial agents within their GI tract at any given moment. Each of these gut microbes is constantly competing for nutrients and space in which to replicate and colonize. A healthy gut naturally maintains a balance of about 80% healthy bacteria to about 20% unhealthy bacteria, though minor fluctuations occur naturally all the time. When this balance become disrupted, pathogenic (unhealthy) bacteria begin to populate the intestinal lumen. This increase can cause illness, discomfort, diarrhea, constipation, lethargy, gas, bloating and may even contribute to more serious conditions like Irritable Bowel Syndrome (IBS) and Crohn’s Disease. Some theories suggest an imbalance in the gut flora may play a role in autoimmune disorders like Inflammatory Bowel Disease (IBD) and leaky gut. The friendly bacteria within our bodies are called probiotic, and it is these microbial agents which Probiotics 10 seeks to support and replenish. NOW Foods also includes Fructooligosaccharides, a prebiotic insoluble fiber, which further stimulates the probiotic bacteria to colonize the intestinal tract. This product can be particularly helpful for individuals currently taking, or just completing, a course of antibiotic medications. Antibiotics are helpful in fighting off unhealthy bacteria which cause infection and illness within our bodies, but antibiotic microorganisms are unable to discern between friendly and unfriendly bacteria. Thus, they automatically kill any which they encounter. This leaves an opening for pathogenic bacteria to colonize and cause digestive symptoms, discomfort or illness within the gut. Restoration of the flora can be aided through supplementation with Probiotics 10 or other formulas designed to quickly accomplish this task. For maintenance of a healthy gastrointestinal tract, taking a supplement which provides a balanced spectrum of live organisms can be essential. These bacteria are those which naturally colonize the gut and are capable of withstanding the highly acidic environment of the early digestive tract. Once they are processed through the acids of the stomach, they are able to reach their targeted areas in the small and large intestines. Here they work to promote better digestive health, less gas and flatulence, decrease bloating, decrease abdominal discomfort, support bowel regularity, improve intestinal motility and help to detoxify the entire system. Over 70% of the body’s immune system is located within the gastrointestinal tract. When the gut flora is out of balance, it can have an influence on immune response and function. Modulation of the intestinal tract, including wall permeability, is important to overall health and well-being. Probiotics 10 capsules can aid significantly in this process. This product must be kept refrigerated in order to maintain viability of the fragile bacteria. The manufacturer suggests taking 1 capsule daily of Probiotics 10 or Ultimate Probiotics 10, either between meals or at another time when the stomach is empty. Do not take this supplement with food products as the acids used for digestion can impact the viability of the live microbes. Most people can take Probiotics 10 without experiencing any side effects. Those who do, report mild symptoms such as gas, bloating or abdominal discomfort. These symptoms usually subside with continued use. Individuals with compromised immune systems should not take probiotic supplements due to potential complications. The human gastrointestinal tract contains trillions of bacteria, each which is either beneficial to health, or detrimental to it. Probiotics 10 capsules are designed to promote and maintain a healthy balance in the gut flora to improve digestion, promote better immunity and provide better overall general well-being. See more reviews of the best probiotic supplements here. Donde compro el probiotico de 20 a 25 billones, radicó en Guadalajara.